This weekend was a memorable one at the Woodbridge Oval, with Jack Hyams bringing a side over from the UK to play Sporting Alfas CC as part of his 90th birthday celebrations. The team consisted mainly of players from one of Steve Harminson´s old clubs, Ashington in County Durham and also included ex Javea and Spain international Paul Stansfield. The local press were on hand to cover the opening of the match, which saw Sporting Alfas legend Gordon Leach (80 in January) team up with Jack (nearly 90) to lead out the Hyams XI to open the batting. Ex Notts county player and pensioner, Paul Taylor bowled the first over to create a combined age of nearly 240 years contesting the first action of the day. The openers played two overs before gracefully retiring to the pavillion and to the two well earned pints that were waiting for them. Two new openers came into to bat and saw off the two openers of Laundon and Munoz without loss with 40 plus on the board. The introduction of Lupson proved the downfall of the visitors, as the Spanish international arguably put in his best performance of the season to finish with figures of 5 for 16 off 7 overs. The Hyams XI did see out all there 35 overs with one wicket intact, but the 117 runs they posted seemed way short on a good wicket with ideal batting conditions. The new opening partnership for Alfas of Spencer and Wasim were rarely troubled and passed the 3 figure mark with minimum fuss in just over the 10th over mark. Just a few runs short of victory Wasim was clean bowled on 47 when looking to put the ball in the car park. Munoz came him and steered the ship home, along with Spencer who remained unbeaten at the end of the game on 68. The post match celebrations saw Sporting Alfas present Jack Hyams with a plaque to commemorate his 90th bithday and in return the visitors gave the hosts a small bat and MCC shirt signed by Steve Harmison. Next week Alfas host Pimlico in one of their last matches of the season, before taking a winter break and returning to cricket in February 2010. Jack Hyams, the world’s most prolific club cricketer, will celebrate his impending 90th birthday with a pair of fixtures at the Clive Woodbridge Oval in Valencia, Spain, this weekend. Hyams, who is Life President of the Barmy Army, enters his tenth decade on December 18, having amassed over 123,000 runs in all cricket, including 171 centuries. He has played ten matches so far this year for Billericay CC Veterans, while three years ago, he took part in five consecutive fixtures for Nomads CC on a tour of Spain, when the club was left short of players. As a youth, Hyams was offered professional cricket and football terms but his father forbade him from taking that career path. Instead he waited until after the Second World War, when he played football for Bradford Park Avenue and took part in a memorable defeat of Arsenal in the FA Cup. 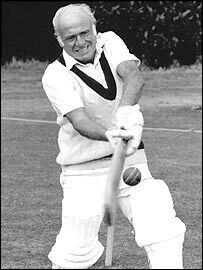 It is a long time since batsman Jack Hyams averaged his age, but at 83 it is unfair to expect too much. Hyams is a legend of the English game, a grass-roots stalwart who has played with and against the world's best. And he has no intention of quitting. Last Sunday at Hove, Hyams played for the Barmy Army - "they made me honorary president because of my age" - in an exhibition match against a side that included England batsman Mark Butcher. Batting at six, Hyams was unbeaten at the end of the innings having seen off an attack of Sussex colts a quarter of his age. "We were 120-2 and then we lost six for nothing, but I carried my bat," Hyams, who sounds not a day over 50, told the BBC Sport Website. "I stayed in there and hit a few fours but I've no idea how many I made." It would be easy to be complacent about an extra "30-odd" runs when you have scored an estimated 130,000 in a career spanning seven decades. Hyams never played first-class cricket - he knocked back Surrey on the advice of his father - but has played for more than 50 clubs and is presently at Billericay, where this season he averages 46. Hyams' opponents over the years reads like a who's who of the game: Jack Hobbs, Jim Laker, Clive Lloyd, Fred Trueman, Neil Hawke, Tony Lock, Wes Hall, Alec Bedser, Denis Compton, Pat Pocock, Fred Titmus, Basil D'Oliveira. He rates Caribbean legend Hall as the fastest he has faced, not that he was moved to wear a helmet. "Fast bowlers have never worried me, I've always liked them," he claims. "I played at The Oval when I was 68 against a Clive Lloyd XI and they were a little bit annoyed when I walked out without a helmet. Reg Harris, 92 on 31 September, keeps wicket for Bugbrooke cricket club. "He stands up to most bowlers and gets some remarkable stumpings," says club president Peter White. "I tried one on once and didn't like it one bit." Hyams has seen cricket change drastically from the days of Sir Don Bradman to the current era of 50-over and even 20-over matches. He remembers the old days with great fondness but is also an avid follower of contemporary cricket. "I have great memories of watching players like Bradman and the 1948 Australians, who in my view were the best side ever," Hyams says. "But Test cricket seems to be dying and often on days three and four the grounds are half empty. "I like one-day cricket a lot and this Twenty20 thing that has started seems to pull in the crowds. "I think in time it will all be all one-day cricket. An American friend once asked me how I can watch cricket for five days for a draw. "He's right. It's like paying to watch a film and leaving half way through. How many people can take four days off from work to go and see a county game?" After his Hove exertions, Hyams was preparing to take the Barmy Army XI on an island-hopping tour to play cricket in Ibiza and Majorca. It's all in a summer's work for the retired pet shop owner from Cockfosters, who with his boundless reserves of energy is the envy of octogenarians the world over. "I think my secret is in the genes, but to be honest somebody up there must like me. "I've got a good wife who looks after my diet and I don't drink much and I don't smoke, well I gave up when I was 70 but I smoked 60 a day up until then. "I suppose I'm just lucky." The world's first game with all participants over 60 years, was played at Brighton , Victoria , Australia , Saturday , 4th January 2003. Two teams of 13 a side , named Yarra North, captained by Alan Duffus, and Yarra South , jointly captained by Jim Williams and David Wingfield played a 40 overs one day match, won by Yarra North . Both umpires Frank Robinson and Kevin McDermott were aged over 60, as were the husband and wife team of scorers, Betty and Stan Hogben, after whom the Hogben-Meckiff Mentone CC oval is jointly named, with the Meckiff family. F Robinson, K McDermott (Umpires), R Thompson, D Fisher, L Mills, Ms B Stubberfield, A Duffus (Capt Yarra Nth), J Williams, D Wingfield (Co-Capt Yarra Sth), Mrs B Hogben (Scorer), H Jelliffe, D Tomlinson, A Broadbent, T Ambrose. Absent from photo: S Hogben , R Magree. Lloyd Mills 81 years, Australia's oldest registered cricketer, and one of two ex-servicemen from World War 2 still playing cricket, travelled down from his farm at Mincha (Near Pyramid Hill). Lloyd played his last game in January 2004. 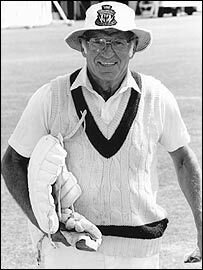 The oldest player to have played 0ver 60 cricket in Australia, is Bill Coghlan, born 13 April 1923. 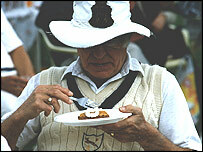 The world's oldest to have played 0ver 60 cricket is Jack Hyams, aged 88years in 2007, from UK. One lady, Barbara Stubberfield, played in the inaugural game. The inaugural National/Interstate 0ver 60 Carnival was held in Canberra in November 22-24, 2006, on three ovals at the Australian National University. On February 10, 2006, the first International Over 60 match took place in Onehunga, Auckland, between Australia and New Zealand. A group of 12 players 0ver 60 toured UK from August 27-September 15, 2007, and played nine games vs 0ver 60 teams there. In 2008, England visited Australia with 19 players over 60 and 10 WAGS of undisclosed ages. The reciprocal series saw Australia, with a 35 strong party, including 10 ladies and an umpire, play 12 games in England during August 2009. The UK Tour Program, random photos, some highlights and score sheets from the individual UK matches are posted under the Events tab above.